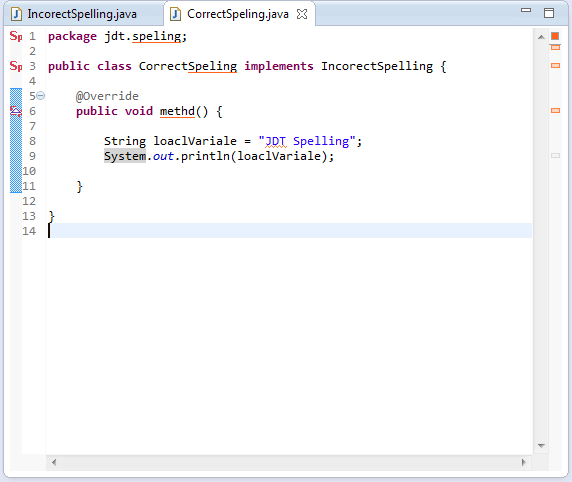 Spelling for Java names using JDT. The aim is to provide spelling support for words contained in the names of Java artifacts: Interfaces, Classes, Methods, ... Splitting out the names using regular naming patters for Java names. By adding the following code below to your website you will be able to add an install button for JDT Spelling. I need to do a quick vendor assessment on this plug-in before I allow my Dev team to use this (we work in regulated environments). Can you please contact me here at your earliest convenience? Our project uses m_ to flag member variables. Now they all get a spelling error. I've added an issue for this and will look into it. probably add a preference for ignoring such prefixes, like the single letter ignore. This is must have plugin when team has members with different level of English.